We’ve hand selected some of the most romantic resorts from around the world for the ultimate couples getaway, from private pools to personal butlers, there’s something for all couples wanting some private ‘us’ time. Here’s our top 10 most romantic tropical beach stays. The scene: Tucked away on the tiny Caribbean island of Nevis, this is the perfect escape for couples looking for that secluded castaway feeling – but with the added spark of classic Caribbean-style fun. Just steps away from the sugary sands of Pinney’s Beach, this retreat boasts sensational views of Nevis Peak and sister island St Kitts. The sleep: 12 charming plantation-style two-storey cottages are home to gorgeous rooms and suites, all adopting a youthful feel with their colourful and contemporary décor. Almost all of the cottages look out onto the ocean – a welcoming sight as the sun starts to set. The stay: With such close proximity to Pinney’s Beach, it’ll come as no surprise that this oasis focuses on al fresco, beachside experiences. Active couples have a myriad of water sports to choose from, whilst those looking to unwind will love the choice of three infinity-edge pools – especially the tranquil adult-only Reflection pool – and the heavenly spa with its volcanic rock whirlpool. Unforgettable dining is paramount too, including decadent rum pairings and idyllic in-villa chef experiences that evoke a truly romantic ambience. The scene: Hidden away on a verdant jungle-clad hillside on the secluded island of Yao Noi, this wonderful paradise offers a view that surpasses many others. Boasting incredible panoramas of limestone karsts majestically rising out of the Andaman Sea, everywhere you turn you’ll be met with natural beauty. The sleep: Indulge in one of the stunning villas, either tucked away in the luscious canopies, or perched near the golden sands. All feature their own stunning infinity-edged pool that juts out into the wilderness, with expansive sun terraces giving you ample space to relax in the sun. The stay: Though there’s ample opportunity to simply unwind and enjoy each other’s company, this resort focuses on awe-inspiring excursions and experiences that bring you together. Get active and climb the limestone, or hop on a boat to sail around the nearby islands. The serene mangrove channels are perfect for an afternoon of kayaking, or you could grab a bike and cycle to the island’s quaint village. If you fancy something more relaxing, the spa located in a traditional Thai longhouse offers sumptuous star-gazing massages, and tucked away on a small beach cove is a wonderful al fresco cinema. The scene: A prime beachfront location combined with upscale décor makes this a perfect choice for a romantic getaway. 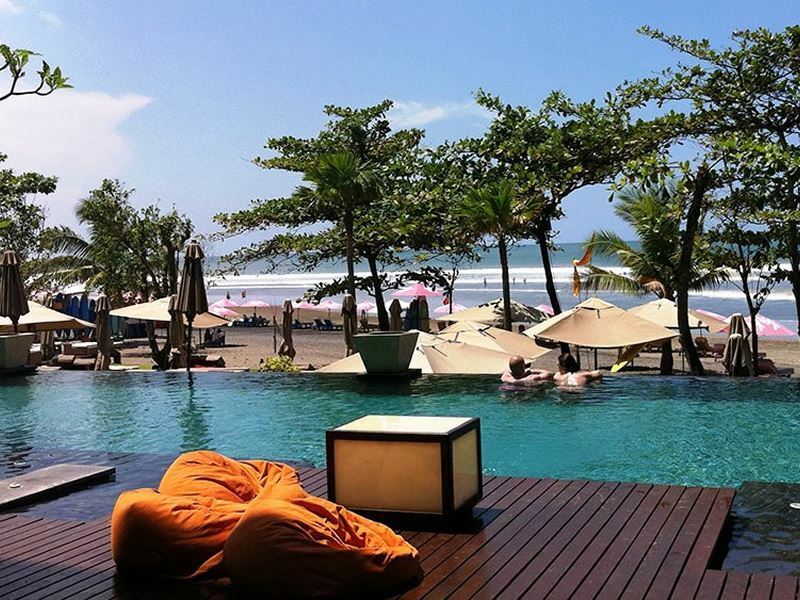 This all-suite resort features ocean views and balconies in every suite, which means you can enjoy the fresh sea breeze and Seminyak sunsets in privacy. The sleep: Whichever suite you decide on for your stay at Anantara you’ll love the elegant ambiance and plush décor, with sleek dark wood floors and spacious accommodation. Incorporating contemporary Balinese design, all of the suites feature a terrazzo tub perfect for two and situated on the terrace, so grab a drink and sit back and enjoy some downtime. The stay: Indulge in the three unique dining experiences this resort has to offer, including one of the best Asian and Continental restaurants in Bali which serves spicy and fragrant cuisine night and day. There’s plenty of activities to keep you entertained if you want more than a suntan, the resort will happily arrange horseback riding through the Bali countryside or river rafting for an adrenaline rush. With a super location close to chic restaurants, cafes and trendy nightlife, this is the perfect place to unwind while enjoying the best of Bali. 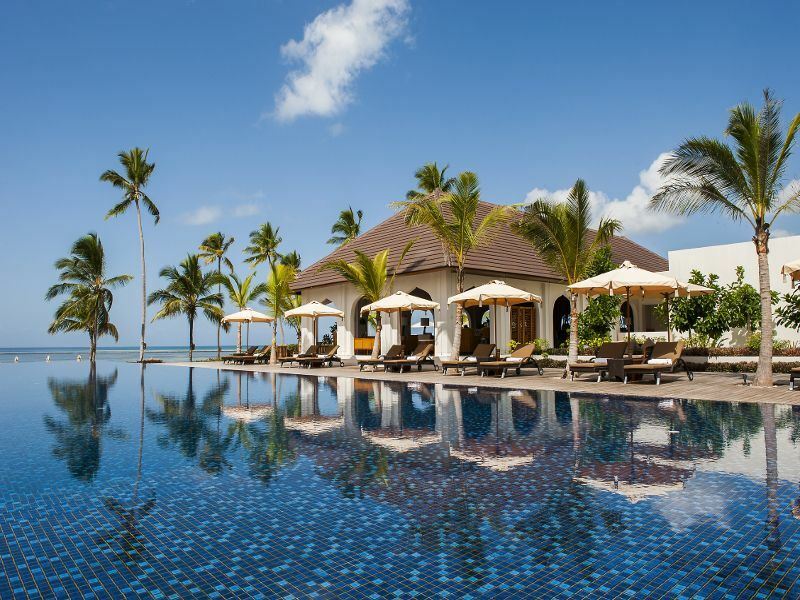 The scene: Imagine acres of stunning tropical gardens lapped by the waters of Tamarin Bay and you’ve arrived at the haven of Maradiva in Mauritius. This unique resort is filled with authentic Mauritian charm, offering tranquil private villas which are the perfect place to unwind and spend some quality time. 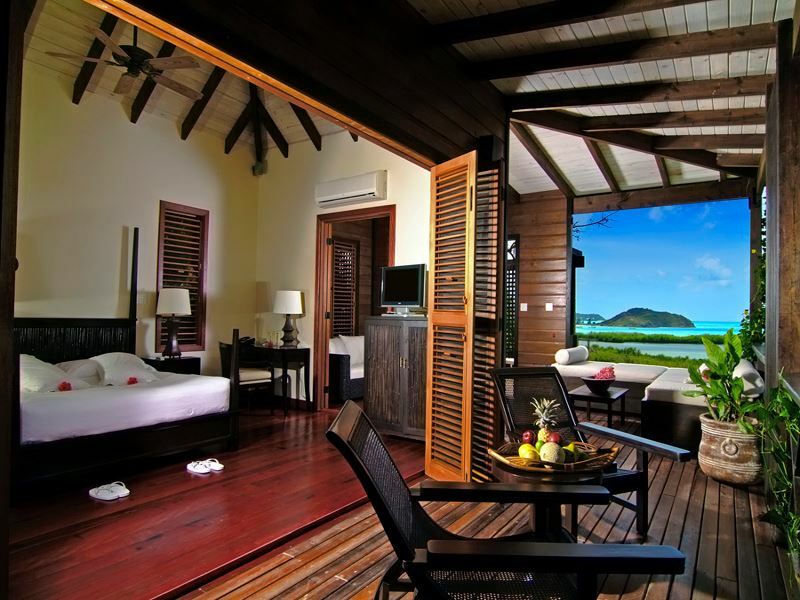 The sleep: Cosily nestled along the coastline sit the resorts 65 lavish villas which all include their own private pool. Couples will be in heaven in the quiet opulence of this resort which offers a 24 hour personalised butler service, so you don’t even have to leave your villa if you don’t want to. The stay: In the heart of the resort lies Maradiva spa which is the perfect place to unwind and rejuvenate, offering deep muscular massages and aromatherapy designed to purify and regenerate. The hydrotherapy pool and steam rooms lend themselves perfectly to stress-free time out, as well as the yoga pavilion for individual or couples yoga. After a day of relaxing head to one of the resort’s four restaurants, serving a mix of Mediterranean, Mauritian and international dishes at their relaxed beachfront venue, with a new menu every evening, including their speciality restaurant serving contemporary Indian cuisine with an interactive teppanyaki cooking area and live music. The scene: Sitting on the breath-taking South West coast of Zanzibar on a mile-long powdery white sandy beach, The Residence is an incredibly luxurious and stylish property. Fusing both contemporary décor with various traditional African influences, this resort has managed to create a unique ambiance of elegance and sophistication for the perfect indulgent getaway. The sleep: You’ll have no trouble getting a good night’s sleep in one of their 66 luxuriously appointed private villas, set amongst a secluded garden or with direct access to the beach they all benefit from their own private pool and a personal butler. The stay: Hidden away within 32 hectares of palm-fringed gardens, this resort certainly offers privacy, space and indulgence without the crowds. Take a stroll along the beach while enjoying the complimentary sorbets and ice skewers, or take advantage of the watersports on offer and your own bicycles. The Pavilion Restaurant serves Middle-Eastern, Greek, Turkish and Mediterranean food, or you can enjoy 24-hour in-villa dining for a relaxing and intimate dinner for two. The scene: Located on its own small private island, this island resort offers barefoot luxury set amongst a luscious jungle setting. With cottages dotted along the stunning white sandy beach, expect your own sea-facing veranda and utter privacy for a truly romantic getaway. 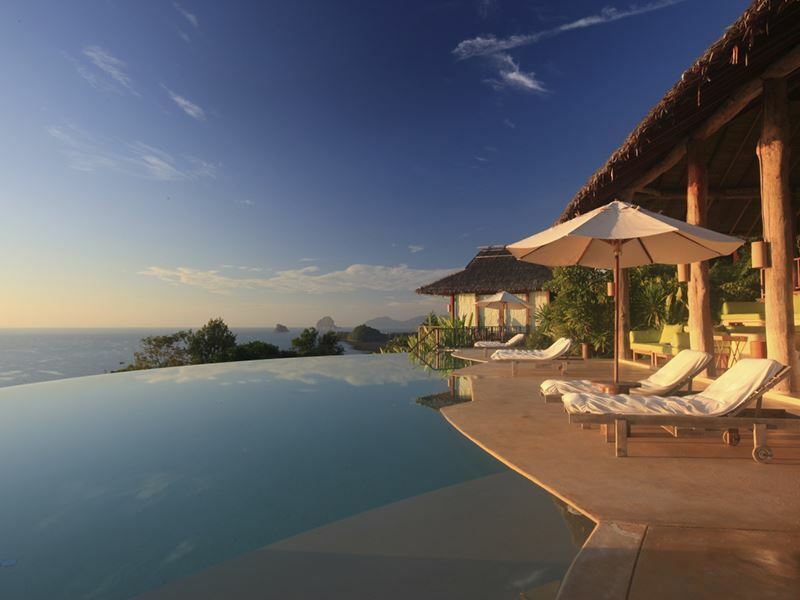 The sleep: The villas here are so secluded you’ll really feel drawn in to this resorts natural charm. No matter which home you choose, you’ll have direct access to the beach, and with no TV’s or Wi-Fi in the cottages, you can really get away from the daily grind and take in the amazing surroundings without distraction. The open-air bathroom adds to the simple life feel of the place, whilst the indoor décor is quaint yet modern, making it feel like a gorgeous beach house. The stay: The waters around Denis are some of the finest for diving in the Seychelles and there are plenty other watersports on offer, as well as nature walks and cycling on your own bicycles to explore the natural beauty of the island. For something a little more relaxed, unwind with in-room massages or spa treatments or enjoy delicious fresh and local food, most of which is from the island’s own farm and gardens. Be at one with nature, enjoy the stunning sunsets and truly make time for each other on Denis Island. The scene: With a gorgeous hillside location, this high-end resort offers spellbinding views overlooking the towering Pitons and expansive Caribbean Sea. Grown-up glamour and unique architecture insures the resort blends in with the natural beauty of St Lucia for a luxurious and romantic stay. 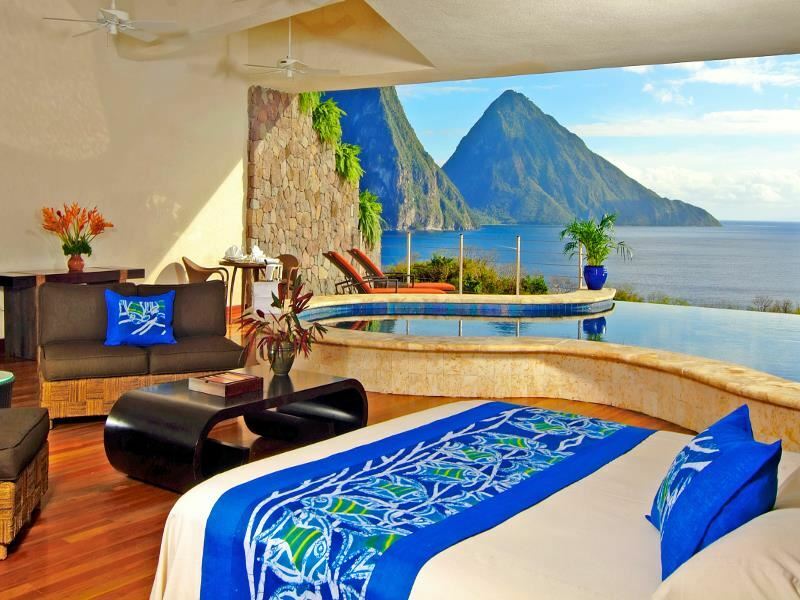 The sleep: You won’t just find rooms at Jade Mountain, each of their 29 ‘sanctuaries’ are built in an open-style with just three walls, allowing for unrivalled views of the soaring Pitons and benefitting from the cooling ocean winds. 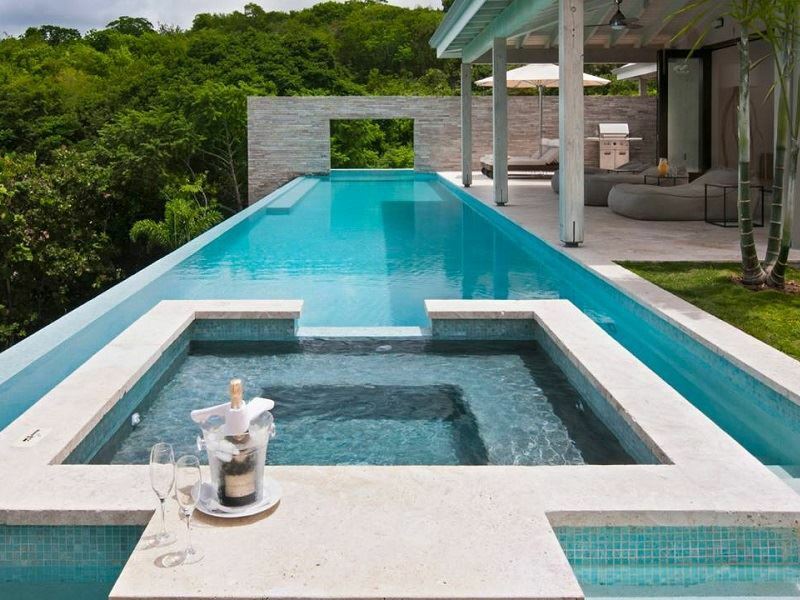 Relax and unwind in the luxurious infinity pool and enjoy the architectural triumph of your sanctuary. The stay: Jade Mountain ticks all the boxes with idyllic views and two sandy beaches perfect for snorkelling and scuba diving. If you’re keen to keep active during your romantic break, the fitness studio and opportunities for kayaking, sailing, mountain biking, tennis and yoga will keep you busy. If your more of the relaxing type, you’ll fall in love with the exotic beauty rituals at Kai en Ciel - meaning ‘house in heaven’. The scene: Located on the east coast of Peninsular Malaysia, this retreat boasts a beautiful destination along the golden sands of Tanjong Jara Beach, shaded by gently swaying palms and designed to replicate the sophistication of a 17th century Malay palace. The sleep: With its elegant Malay architecture, it’ll come as no surprise that this beautiful resort boasts truly regal décor, with rich, golden hued fabrics and local timber furnishings. 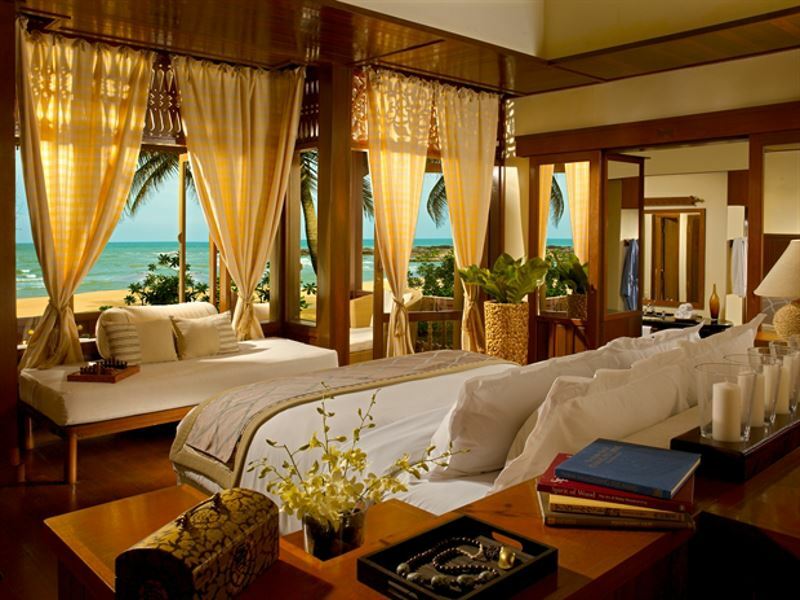 Though all are luxurious, we find the Anjung Rooms inspire romance the most, with wonderful views of the beachfront, an outdoor bath in a private tropical courtyard, and a canopied veranda overlooking the gardens and sea. The stay: Based on the Malay concept of Sucimurni – a focus on the purity of spirit, health and well-being, days here are incredibly relaxed and laidback, the sun-drenched beaches and two pools offering a tranquil escape to revive and unwind. The Malay culture is utterly romantic, so you can spend your time together turtle watching, enjoying picnic lunches by cascading waterfalls, and learning to cook and handicraft the Malaysian way. The scene: Take a break from reality to relax at this indulgent and elegant boutique hideaway, hidden in a secluded bay with both beach and hillside suites, this sophisticated hotel offers stunning ocean views and is the ultimate beach retreat for couples seeking seclusion. The sleep: With 25 luxurious suites, the accommodation at this hotel is sleek and secluded, the Hillside Pool Suites have a private sun deck and plunge pool and the Beachfront Suites have an enviable location right on the sand. All suites feature an outdoor dining area so you can experience a romantic meal on your own private terrace with the one you love. The stay: Enjoy a cocktail by the pool overlooking the sparkling waters of the Caribbean, paddle board, windsurf or simply sunbathe. If food is your thing you will love this hotel, where new menus are created daily and produce is sourced from local suppliers and from the hotel’s own organic kitchen garden. Their restaurant overlooking the beach features live calypso music for a chilled out Caribbean vibe. 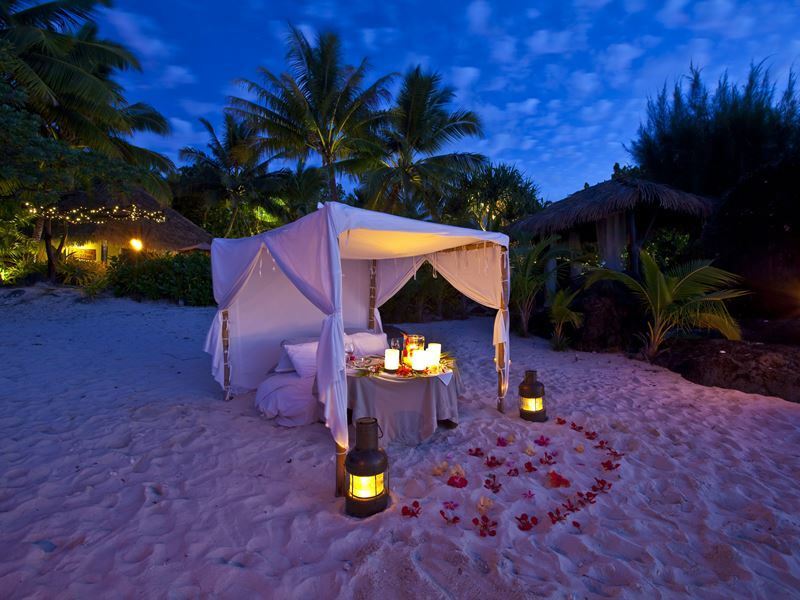 For a truly special evening, staff can also arrange a private romantic meal by candlelight on the beach. The scene: A haven of exotic beauty in the tranquil turquoise waters of the Aitutaki Lagoon in the Cook Islands, Pacific Resort offers an intimate collection of only 27 luxury beachfront bungalows set on its very own piece of paradise, the only thing to do is sit back and enjoy the views. The sleep: Each of the bungalows are very spacious and feature a private sundeck so you can enjoy being only a few steps away from the sparkling waters while enjoying the privacy of your own outdoor space. Relax into the very comfortable super king sized beds and enjoy the peaceful ambiance the Polynesian décor creates while watching the day go. The stay: While offering the perfect place to kick back and unwind, Aitutaki is also home to some popular activities such as kiteboarding and bonefishing, which you can try your hand at by joining a local expert for a half or full day bonefishing charter or adrenaline filled boarding lessons. For a gentler activity, the resorts spa offers indulgent treatments which you can enjoy in your room on directly on the beach with the sound of the ocean a stone’s throw away. Find out more about our idyllic selection of Romantic Holidays, offering peacefulness and luxury to loved-up couples all around the world.